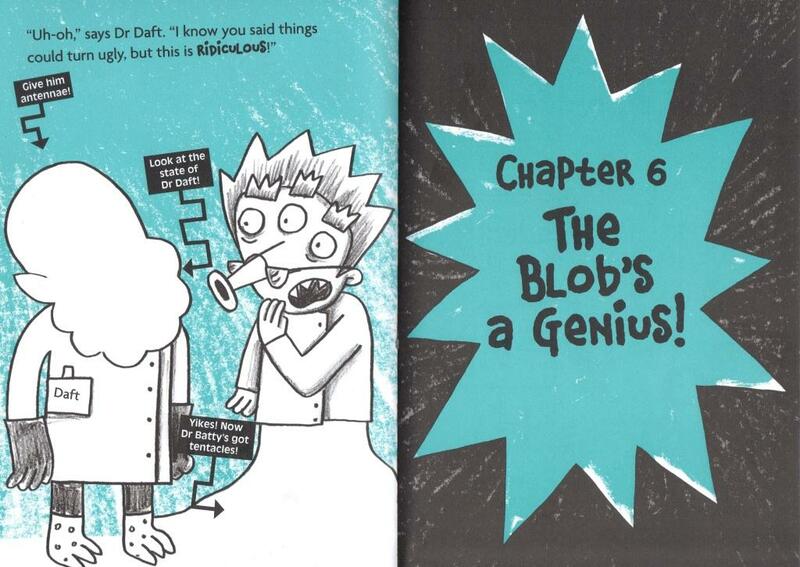 New independent publisher on the block Nosy Crow have recently launched their Mega Mash-up series aimed at boys of 7+. The look and feel of the books mirrors other short series publications like Astrosaurs or Spy Dog. What’s new is the ‘draw your own adventure’ aspect and the brazen repeated combination of everyone’s fave character types. You like Roman gladiators and dinosaurs? Here they are in the same book. You like robots and gorillas? That’s book two. And the latest book in the series? That harks back to 50s B-movie heaven: aliens, mad scientists and an undersea location. What more could a young boy want? 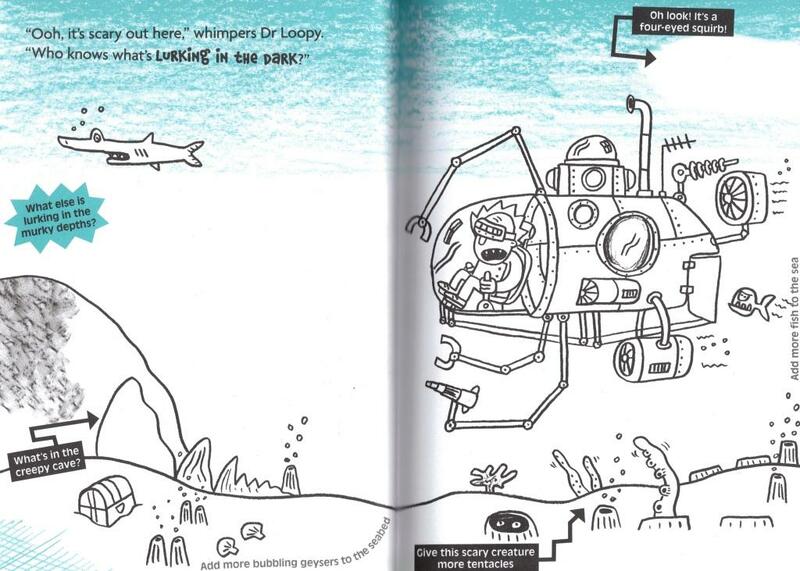 Even before you open Aliens v MAD Scientists under the ocean, you know this is a book not just for you – but by you, with an invitation to add your own name to that of the author and illustrator on the cover. Look inside and every page is packed with opportunities to participate in your own ‘sketching adventure’. It’s a great setting, with lots of opportunities to create scenes and creatures under the sea. The paper is high enough quality that it should survive even the thickest of felt tips. The existing drawings look child-like enough that you feel welcome to add your own. There’s useful advice at the start about choosing your drawing tools and producing textured patterns. There’s a good mix of directed instructions (“he looks well shocked” pointing to a small blank face) and more open-ended tasks (“what else is lurking in the murky depths?” next to plenty of white space for you to fill with fantastical sea creatures). A picture glossary at the back of the book includes sample drawings you might like to copy. I have to admit, in true sticker book mentality, I had a strong urge to cut these pics out and stick them on to some of the pages. Sadly they are printed back to back so you would need to copy them to do this. The story itself is simple enough for kids to read themselves, though phrases like “rebalanced the quantum flux on the magnetizer” or “are they genetically modified?” might cause some confusion. And you can also read it without drawing any of your own pics. However, since all good picture books tell some of the story through images, if you take part you can actually shape what happens (within some specified parameters of course). With this in mind I was slightly surprised not to find an entirely open spread at the end of the book – I personally wanted to draw the final scene or epilogue, a bit like the feasts that take place at the end of every Asterix book… This approach would also give the reader full power to resolve and complete the story. The Mega Mash-up series certainly fulfills each of these and I’d recommend the books to any 7+ boys (or girls!) I know. My one criticism is that, despite use of contemporary terms like ‘mash-ups’ and ‘genetic modification’, the content of the book is firmly stuck back in the world of that 50s B movie. The scientists are all, as is clear from the title, ‘MAD’ – with names like ‘Batty’, ‘Nerdy’, ‘Egghead’, ‘Crackers’ and ‘Daft’. They all wear white coats, and glasses of some incarnation. And they’re all male – or at least I think they are. I know this is probably the language and imagery the reader expects and likes (going back to Kate’s first rule above) but it seems sadly stereotypical from such a contemporary and forward-thinking team. So next time you feature science, Nosy Crow, please take a more modern perspective! Mega Mash-up: Aliens v MAD Scientists under the ocean by Nikalas Catlow and Tim Wesson is out on June 16th. The next book in the series, Pirates v Ancient Egpytians in a haunted museum publishes in September. Thanks for this thoughtful and enthusiastic review of this series. I want to come back on a couple of points. The ridiculous names (Pharo Nuff features in the forthcoming Pirates v Ancient Egyptians in a Haunted Museum) are very much part of the broad humour and the very basic characterisation that are an aspect of these short books. They’re about fast and funny action, and the silly names felt a match for that. The world of Mega Mash-ups is very much a boy’s world. When I came to Kingston, I said that one of the key questions we ask ourselves is, “who is it for?” when we are choosing whether or not to publish a book. We have to have a very clear sense of who the core audience of a book is. The core audience for these books is 7 year-old boys who are reluctant readers. We wanted to create a book that was just right for that audience. At 7, boys want nothing whatsoever to do with girls. It’s a time when children’s social lives are very much split along gender lines. I didn’t really see the sense of trying to create something catch-all because doing so would, in my view, have compromised the appeal to our core audience. Finally, on the question of complicated vocabularly, we saw these as books for reluctant readers, not for children who struggled with reading. We are not creating a limited-vocabulary reading-scheme here. It’s my experience as a publisher that children are more than willing to decode difficult words that are interesting to them (many two year olds who can’t say the word “sandal” can say the word “Tyrannosaurus Rex”), and the sci-fi gobbledegook is, I think, sufficiently interesting for a child to decode, but, if they don’t, it doesn’t hugely matter – it’s not critical to the story, which is, as you say, told through pictures as well. Hi Kate, thanks for taking the time to read and comment on my review. You are right that the book is well-targeted to it’s audience, including the ‘silly names’ and technical vocab. In fact I think it’s a great piece of publishing and, as I said, I’d recommend it to that audience myself. My concern really came from a different perspective. When I’m not teaching (or doing) commercial publishing, I spend a lot of my time communicating science. One of the challenges to intelligently enaging people (both boys, girls and grown-ups) with science concepts and the work of scientists is the ‘persistent stereotype’ of scientists as mad, wild-haired, lab coat and glasses wearing men. Ask a child to draw a scientist (quite a common research method to explore children’s images of scientists) and this is traditionally what their sketch will depict. Researchers claim that ages 8-14 are critical in the formation of children’s attitudes to science,that what children know about science and scientists is generally derived from media outside schoool and that through their reading children learn to respond to scientists as eccentrics – something that can also affect adult attitudes. There’s even a view “that reinforcing the white-man-in-a-lab- coat or mad-scientist stereotype could diminish not only children’s interest in science, but also the diversity of future scientific workplaces” (see http://www.sciencebase.com/science-blog/scientific-stereotype.html). For anyone interested in the research, here are some relevant papers. I might blog a more exhaustive list and summary in a while. Buldu, M. (2006) Young children’s perceptions of scientists: a preliminary study, Educational Research 48:1, 121-132. McAdam, J.E. (1990) The persistent stereotype: children’s images of scientists, Physics Education 25, 102-105. Silver, A. & Rushton, B.S. (2008) Primary-school children’s attitudes towards science, engineering and technology and their images of scientists and engineers, Education 3-13, 36:1, 51-67.